I have been really slacking in my updates recently. For a couple of weeks, that was because I didn't have much to say. I've still been getting hours of overtime at work, and then my reduced time off was spent harvesting from the garden and then preserving, which doesn't make for much in the way of update material. Then wednesday_10_00 arrived August 14 for an extended stay, and most of my free time switched to doing things with her. We took a trip up to Japantown for some shopping on the weekend, and we've been playing a number of board games. 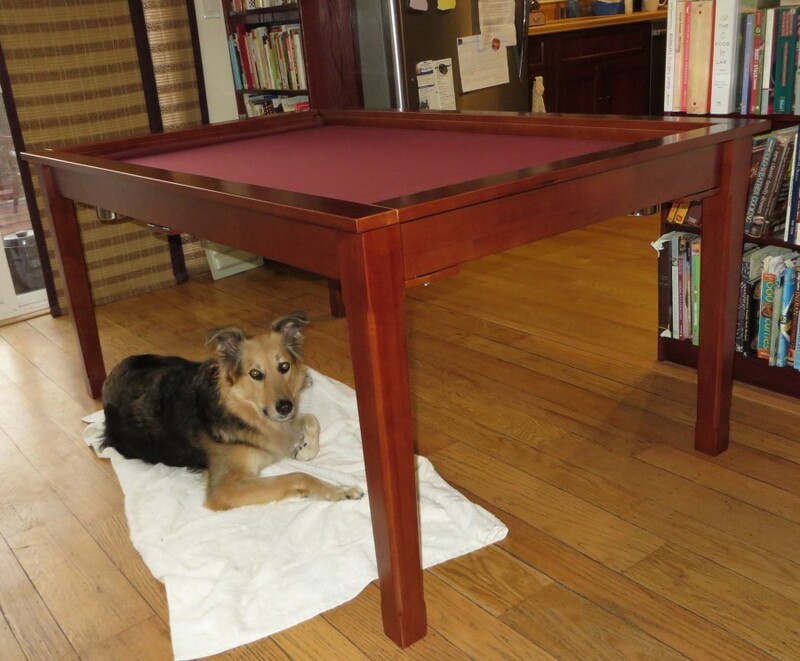 My new board gaming table arrived (shown here with my neighbor's dog as the model). It has a two-piece top that covers the interior well, allowing it to be used as a regular dinner table. The topper is rather heavy and awkward to move, so I don't know how often I will be taking it off, but it's nice to have the option. Now I just need to figure out what to do with my old dining table. Aside from all that, I've been squeezing in as much time knitting as possible. I'm trying to make a gift for a baby shower coming up in a couple weeks, and I'm pressed for time. Since it takes two hands to knit, it's hard to combine that with any other activity, besides just watching TV. We're currently suffering through a record-breaking heat wave. Temperatures have gotten into the triple digits, which is completely nuts for this area. It doesn't even cool down much at night, which makes for a tough time sleeping. It also doesn't help that leaving the back door and windows open to catch any available breezes also lets the mosquitoes inside. ~_~ Thankfully the temperatures should start going back down today. My crazy overtime schedule should finish up by the end of this month, garden harvesting should be slowing down, plus the baby shower will be over soon, so I expect to have more free time after that. My plan is to get my Munich trip report done sometime near the middle or end of the month and then transfer my entries over to Dreamwidth.